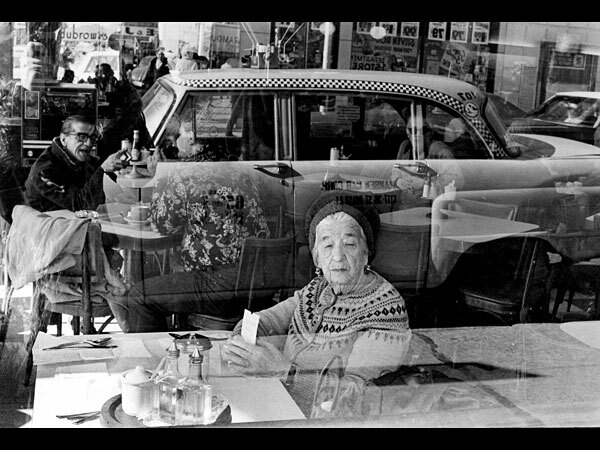 Halperin's photograph—the reflection of a Checker cab on Dubrow's window that appears to mingle with the patrons seated inside—joins nine others in the Top 10 "cut of the crowd" that comprise the museum's show, Click! A Crowd-Curated Exhibition. Entirely Web-sourced and Web-curated, the exhibit represents the first use of "crowd-sourcing" by a nonprofit in this way. 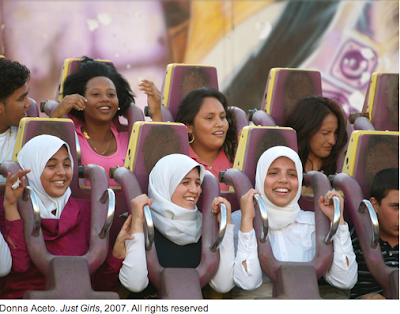 The museum's goal: to build community, woo potential donors, and raise awareness of its work. Organizer Shelley Bernstein, BMA's dynamic new manager of information systems, was inspired by the 2004 book, The Wisdom of Crowds. In it, New Yorker columnist James Surowiecki offered the world a simple but profound idea: a large, diverse group of people will make better judgments and smarter decisions than an elite few—no matter how individually brilliant. Bernstein set out to test that theory in the context of visual art. First, she displayed the images anonymously on the museum's Web site, where anyone interested was invited to log on and rank them, one by one, on a sliding scale from "least effective" to "most effective" in fitting the theme. After a six-week rating period, Bernstein posted the top 20 percent of the images selected—78 photographs in total—on the site and they were pared down further by the crowd. Finally, Bernstein grouped them on the site into various lists, including "Most Discussed" and "Top 10 Compared." Watch this site for more on the lessons of Click! I'll be moderating a September 23 panel on Web 2.0 technology and nonprofits that will include Bernstein and a discussion of her experiment at the Harvard Business School Club of New York's Social Enterprise Summit. In the four years since Surowiecki's book, the phrases, "the hive mind" and "crowd-sourcing" have entered the lexicon: those inventing the next, "2.0" version of the Web are testing ways that companies, educators, and social change advocates can tap into their thousands of new and expanding social networks—on demand—for better ideas, more money, and greater influence. Photographer, filmaker, and multimedia artist Douglas Gayeton is a new kind of digital storyteller. He creates immersive story experiences for virtual worlds and social networks, including Second Life, Gaia, Habbo Hotel and Sony Home—the first high-def virtual world (which released in public beta in June). In case you missed it the first time around, here's a clip from one of Gayeton's better-known projects, Molotov Alva and His Search for the Creator: A Second Life Odyssey. He wrote, produced, and directed this documentary, the first-ever shot entirely within Second Life. The highest-rated video in the world on YouTube, Molotov Alva was purchased recently by HBO. Gayeton is the chief creative officer at Millions of Us, a San Francisco-based agency that specializes in marketing programs in Second Life. He is preparing a one-man retrospective of his works for Slow Food Nation, a San Francisco celebration of the sustainable food movement that's to be held at Fort Mason over the Labor Day weekend. I will be sitting down with Gayeton in Chicago in early September to hear about his plans for using virtual environments to raise awareness of social issues. "People sometimes use virtual worlds to redefine themselves and the world in a way that's closer to the vision that they have of it and themselves," Gayeton says. Watch this site to learn more about Gayeton and his thought leadership on the newest forms of social media for social change. Indeed, like the athletes competing for Gold in Beijing’s Water Cube, China's censors have wasted no time showing off their speed and muscle: their moves to censor Twitter, crack down on video-sharing sites (both YouTube and a Chinese version of it called 56.com), and make it hard (if not utterly impossible) to load some Web sites such as Human Rights Watch and Reporters sans Frontieres from inside the Foreign Press Center remain firmly (and predictably) intact as of today. But what's happening this week in China, despite the widespread use of beefed-up, anti-censorship software by those would not be bowed, is more than simply an internationally-broadcast dust-up over who gets the last word (or the first online). Internet censorship is on the rise in many countries, partly a reaction by nervous governments to the rapid and growing use of social media by citizen activists around the world. John Palfrey, executive director of the Berkman Center for Internet and Society at Harvard, says there has been a surge in the scale, scope, and sophistication of Internet filtering. In the past five years, he says, "we have gone from a couple of states doing state-mandated Net filtering to 25." 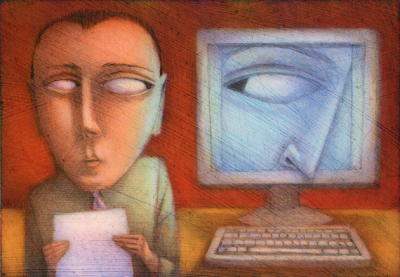 But there's another big reason for social-change advocates to pay attention to Net censorship. The issue isn't just about the type and number of Web sites accessible to Netizens at home and abroad. It's also about what a free flow of digital information enables people to do. Social media, unfettered, change the way people in society organize themselves to get things done. Such things as mobile phones, Twitter, video-sharing services, and social networking sites make it really easy for people to self-organize into groups from the ground up rather than to be organized by others from the top down. New media expert Clay Shirky, the author of Here Comes Everybody, a new book on the impact of social media on society, says this Net-driven social revolution (with a small "r") won't be occurring at the expense of existing institutions (like governments or nonprofits, for example). But it could, he says, provide compelling alternatives that may, over time, weaken them considerably. Not sure you're ready to jump in yet? Go ahead. Re-read your mission statement. Take it global. Welcome to the war. Small world? Apparently so. A study by two Microsoft researchers of 30 billion electronic conversations among 180 million people around the world suggests that socially, each person on the planet really is, at most, about 6.6 people away from knowing actor Kevin Bacon (left)—or any other stranger on Earth. The study—which reviewed one month's worth of Microsoft Messenger instant messaging traffic—was presented to the World Wide Web 2008 Conference in Beijing in April and reported today in The Washington Post. 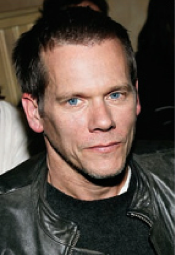 The findings appear to corroborate the popular "Kevin Bacon" theory of social networking that puts you just one degree away from everyone you know, two degrees away from everybody they know, and so on. At best, this six degrees of separation, or small-world theory, says that any two people—on average—could be linked by roughly seven or fewer acquaintances. So why does this Microsoft study matter? Researchers say the findings underscore the real-world power and potential of social networks and social media to organize groups of people in order to raise money, spread ideas, and influence the way others spend their time. Until now, the "six degrees" theory was only a hunch. Now, researcher Eric Horvitz told the Post, "it's pretty shocking. What we're seeing suggests there may be a social connectivity constant for humanity...People have had this suspicion that we are really close. But we are showing on a very large scale that this idea goes beyond folklore." "I thought at first that they were making fun, asking why a loser like me could know so many people, right? (laughter) Then I met these guys and saw it was for real," Bacon said. "Now, of course, this concept (of six degrees) is in the zeitgeist: the movie, Babel, was all about human connectivity. The potential here is that one person can reach out to two people and have those two people reach out to two more, and so on, and see the power of change grow exponentially around somebody's hope of having an impact. " Bacon's sixdegrees.org site—developed with social entrepreneur Bill Strathmann, the CEO of Network for Good and co-author of People to People Fundraising: Social Networking and Web 2.0 for Charities—has raised some $4 million for a variety of social causes.